Joe Stein is a Londoner, born in the 1960s. He admits to being an ex-musician and sometime amateur boxer and won't say much else. He always wanted to try to write and although his first book took many years to complete, he now has four novels to his name. Michael Wood, crime fiction reviewer. 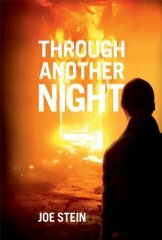 Joe Stein's 'Through Another Night' begs to be read. The Author's captures his story in an intelligent and intriguing manner. Extremely well written, good characterisation and all that the reader expects from a good literary crime novel. Stein's style could be compared to the late Barbara Vine as he plumbs the depths of the human psyche with all its foibles. A good read that deserves to be read and celebrated. His protagonist Garron is an excellent creation. Garron's awareness of physicality and space makes this a very special read. Another cracking read from an up and coming author. A vivid mental image of the darker side of human life. A thrilling ,fast-moving book with a tough but very human hero. Unputdownable to the very satisfactory end! His best book yet! A thoroughly enjoyable book that was almost impossible to put down. A great book. Exiting, gritty and true to life. Thoroughly entertaining read. This is Joe's fourth book in the "Garron" series and they just get better and better. Start to finish in 24 hrs!. The degree of realism and subject knowledge is astounding and reflects the time and effort that must have been taken in research and preparation. Either that, or Joe has a very dodgy past! Looking forward to "Garron 5" already. I have read all the Garron books so far and they keep getting better and better. This one was unputdownable with its non-stop action and resonating character sketches. I've been waiting for this book ever since the cliff-hanger at the end of Book 3. It's so nice to have that Garron-shaped hole filled in at last! Another great read from Joe Stein, cover to cover in 4 days leaving me hungry for next installment. Joe has created a hugely believable character in Garron. I have read all 4 of these and enjoyed them. Keep up the good work Joe! great read! struggled to put it down. Garron just grows and grows on you as you read the book. Very good read. Really couldn't put it down. I have read all of the Garron series so far and can't wait for the next. This is the fourth book in the series and I have grown to admire the lead character's intellect, physical prowess and bravery. Whether his ethical code during his fast action exploits make him a hero or anti-hero is a question for each reader to work out! A very satisfying 'gritty realistic' thriller - Garron scares me - which is why I enjoy these books so much! So realistic - Garron is a very credible character. Best read I've had in a long time. Have read 3 of Joe's books (haven't read the first ... yet). Very enjoyable and a great insight into another world. Go Garron! Thumbs up. Great series. Great characterisation. Just right for a winter's evening when there's nothing worth watching on the television. Terrific, fast action and exciting. A real page turner - couldn't put it down. Can't wait for the next one in the series - this is the best so far. Thrilling new book from a great crime writer who deserves to be more widely known. Fast pacing and action packed - had to finish it straight away. Brilliant character descriptions and well written. Joe Stein's books just keep getting better and better. Joe's best work so far! Another page turner by Joe Stein. This grittty book is "Minder" with menace. Be great on the big screen. Gritty and gripping, a fantastic read. Joe Stein has created a hugely memorable character in Garron, whose personality remains in the memory long after you've closed the final page. A tough, gutsy yet vulnerable character with whom the reader becomes involved very quickly. Great novel and highly recommended. Joe Stein is one of my favourite authors and Garron is one of my favourite characters because he is so very REAL. Once again an exciting and enthralling read as you are immersed into the world of Garron. From his first book to this latest addition Stein never fails to keep the action racing in his work. Another wonderful thriller that maintains a realistic edge sorely lacking in the genre.